Tom appears alongside his brother Henry in the wonderfully delicious programme The Fabulous Baker Brothers on Channel 4. The Fabulous Baker Brothers kicked off 2013 with their second series and accompanying second book; Glorious British Grub. In 2010 Tom appeared in a documentary for BBC4 called In Search of the Perfect Loaf. It took him the length and breadth of the country, exploring methods of bread making. In the same year he appeared on Mary Queen of Shops on BBC2. Tom is a 5th generation baker with hot bread in his genes and with a proven ability to share the good bread message he is winning people over to the light side. Fresh out of baking college, he won Young Baker of the Year with an ambition to ‘do for bread what Rick Stein has done for fish’. 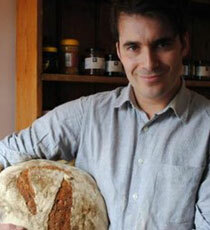 With a wealth of artisanal nous and a lively baking and business heritage, Tom has gone on to collect numerous awards. His family business, Hobbs House Bakery has won Organic loaf of the year, 9 out of 10 times, and been featured in the aforementioned Rick Stein’s Food Heroes, as a Super Food Hero, Henrietta Green’s Food Lover’s Guide to Britain, and also featured in the Independents top 50 food shops. As a baker, Tom is passionate about eating, sharing and making bread. With his wood fired oven at his bakery/cafe by the stream in Nailsworth, he regularly gives talks, demonstrations and bread making courses. Tom is the eldest of six and is father to four children, meaning there is always something to report in his columns. As a highly respected and knowledgeable baker Tom has judged at baking events across the world, including Pain, Prosciutto, Fantasia in Umbria Italy, as well as Young Baker of the Year in 2001. Healing the hurt caused by 70 years of abominable bread, Tom might just be the best thing since sliced bread. Tom with his brother Henry form ‘The Fabulous Baker Brothers’. With two successful series in the UK (for Channel 4), they are now bringing their British culinary magic to the US with a new show for Discovery.